The Arabian desert in the late 6th century was a very difficult place to survive. Most of the Arabian Peninsula is harsh hot desert, except for the cooler areas along the southern coast, and the western mountain regions. Here there are few lakes or permanent rivers. Most of the area is unsuited for agriculture, and in ancient times people lived at an oasis or in one of the small commercial centers. However, in ancient times the majority of the people were nomads who traveled from one seasonal animal grazing area to another. Arabian Peninsula lifestyle was organized around the clan or family. It took several of the clans to make up a tribe. The main purpose of the tribal unit was to provide protection and support. The tribe was the cornerstone of society because of the security that it provided. Smaller poorer clans were usually forced to abide by the decisions of the larger more powerful tribes. The leader of the tribe was called shaykhs, and he usually came from one of the larger, wealthier tribes. These nomadic tribes survived by eating the meat and drinking the milk of their herds and flocks. Mostly, they raised goats and sheep. The nomads used camel hair and wool to make clothing, tents, and blankets. 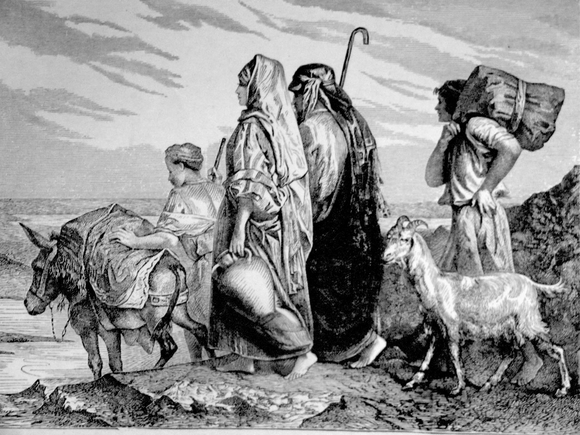 They also robbed and raided other nomadic tribes for whatever they could carry, including women. At this time, their was no central authority or law. Largely, it was up to the tribe to avenge a wrong, and vengeance killings were common at this time. Sometimes these feuds resulted in great loss of life. These earlier people worshiped a variety of gods. However, they recognized one supreme god which they called Allah. They believed that Allah had little involvement in their daily lives. Who and what they worshiped usually depended on what community they were from and which clan they represented. Some religions at the time involved angels, fairies, and blood sacrifices. There was also the “Jinn,” a demonic creature who inhabited the natural world. These ancient people believed that you should never anger a Jinn, and often they left food at sites that were believed to have been burial places of their spirit. They believed that Jinn could be either good or evil. Jinn was thought to have been possessed by poets who were valued members of society. One religion that had great influence on the creation of Islam was the ancient religion of Zoroastrianism. Also, at this time people began worshiping trees, rocks, and animals. This religion is called animism, and the city of Mecca became a holy place because of animism. Mecca emerged as a religious center when a meteor struck the ground and became an object that was greatly respected by the locals who were practicing animism. Islamic legend tells us that the black stone fell to earth around the time of Adam and Eve, and that Abraham and his son Ismael built it. Eventually, the stone was surrounded in an enclosure called the Kaaba, and it was filled with numerous religious objects, images, and paintings. Not only did pilgrims come here to pray, but because violence was not allowed it became an important commercial area.